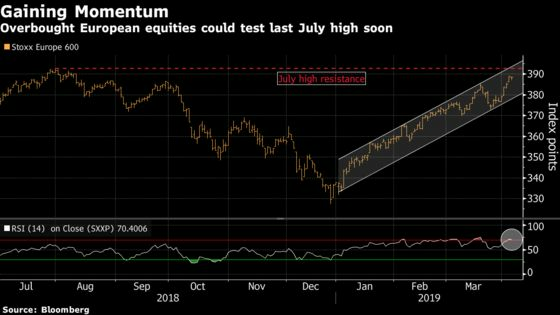 (Bloomberg) -- With European stocks trading near eight-month highs, a number of voices are starting to warn that the rally might have gone too far, especially given mixed signals on the macro and micro fronts. We may be reaching a point where European stocks look too toppy to buy or cover, but not high enough to short. For now, “buy-on-weakness” still rules. The question is, for how long? Yesterday, JPMorgan CEO Jamie Dimon warned investors to get ready for more wild rides like the one that hit markets at the end of 2018. 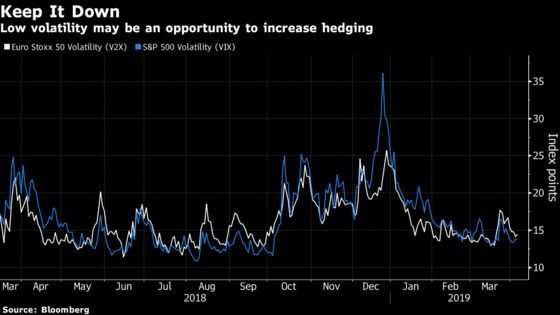 Separately, the U.S. bank’s strategists recommend hedging against recession risks, raising holdings in cash and government bonds. JPMorgan isn’t alone. Edmond de Rothschild Asset Management CIO Benjamin Melman has noted the return of short positioning on volatility, coupled with low liquidity, is hinting at more uncertain times in financial markets. The investment manager has tactically reduced its equity weighting. Pictet Asset Management Chief Strategist Luca Paolini goes further, anticipating a correction for stock markets. 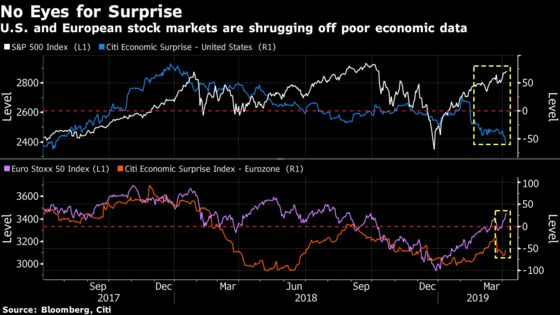 Slow earnings growth and poor economic trends are putting valuations at risk, so the strategist is now underweight equities and overweight cash. Investors have so far ignored warnings, and not for the first time, so this rally could have legs. Flows relentlessly departed equity funds, even during sustained market gains, while lackluster volumes suggest real money wasn’t really participating. But the S&P 500 is close to an all-time high and the Stoxx 600 is showing momentum. European shares have made a series of higher highs and higher lows, indicating the trend is undisputed. That might help explain why Citi strategists’ bear-market checklist only shows four out of 18 red flags, prompting them to keep buying the next dip in equities, arguing that in the short term, the market isn’t in “euphoria,” but only neutral. In the meantime, Euro Stoxx 50 futures are up 0.1% ahead of the open. Watch trade-sensitive stocks after China hailed a “new consensus” and U.S. President Donald Trump talked up the prospects of a “very monumental” deal, though this may still be a few weeks away. Watch miners, steelmakers, semiconductors, autos and other cyclical segments like industrials and chemicals. Watch the pound and U.K. stocks as cross-party talks are said to be productive and the battle is centering on whether a second referendum should remain an option. Separately, the pound rose after the BBC reported European Council President Donald Tusk was said to propose a 12-month flexible delay to U.K.’s Brexit. Watch banks after a survey said the European Central Bank will pay them to lend as it tries to find ways to support economic growth that looks increasingly shaky. There is unlikely to be any material reversal in the short term of the rough environment U.K. estate agents have experienced over the past couple of years, Berenberg writes in a note double-downgrading Purplebricks while upgrading Foxtons and Countrywide. Overall fee pool is expected to continue to decline by about 1% a year as house price inflation is offset by pressure on fees and lower existing home transactions; lettings still a long-term growth market and improved cross-selling an opportunity for the bigger players. Jefferies becomes only bank of 10 surveyed by Bloomberg to recommend selling Stagecoach, saying the U.K. transport firm’s bus business could be source of “long-term pain” for investors. Cuts full-year 2021 EPS by 9%; rating to underperform from hold, price target to a Street-low 125p from 145p. Volvo and Metso are estimated to report the biggest beats in 1Q with catalysts throughout this year, Citi says in a European machinery note. Says Kone and Atlas Copco seem more vulnerable at new peak relatives against declining EPS momentum.